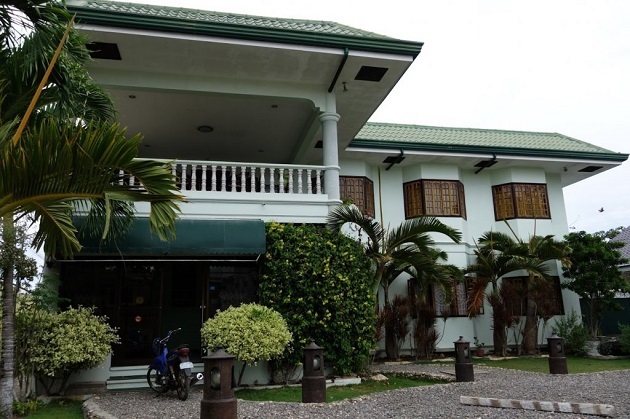 Citadel Alona Inn is a non-beachfront two-storey inn set amidst a well-cared for garden of green grass and tall coconut palm trees. Completed in early 2005, the Inn offers bed & breakfast accommodations to divers, backpackers, and transient business travelers. The whitewashed imposing building houses ten (10) room accommodations with common bathrooms for male and female at each floor; each with a shower and toilet cubicle. Aside from rooms, the 2nd floor gives way to a kitchen/dining room with a balcony where guests can dine and relax at will. 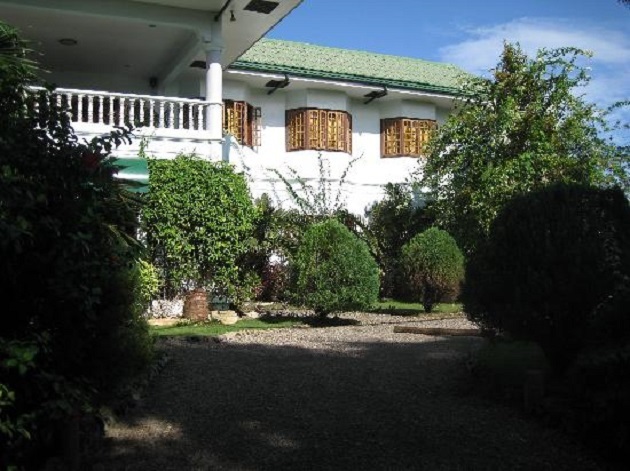 Citadel Alona Inn is located at lot 4480-A, Purok 7, Barangay Tawala, Panglao, Bohol, Philippines. The Inn is a mere 8 minute walk, about 200 meters, from Alona Beach which is blessed with white sand fringed with tall coconut palm trees. Eateries, restaurants and bars are available at Alona, all within walking distance to each other. There are four (4) family rooms equipped with two (2) 42” wide single beds and a 42” pull-out bed with bedside tables on both sides of the beds and luggage racks. A lampshade is provided on the bedside table at the center. The beds come complete with mattress, bedcover, blankets, and pillows. 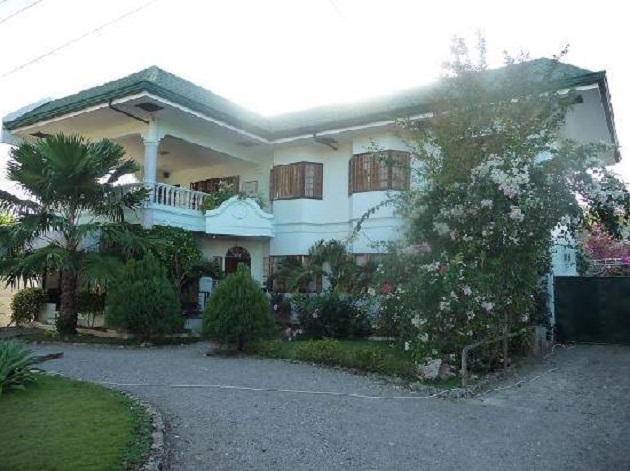 The rooms are good for 4-6 people and can be rented either with a fan and air-conditioner or with a fan only. Additional mattresses are available upon request. There are six (6) single rooms equipped with fans only that can accommodate two (2) people. Each room has a 42” wide single bed that comes complete with mattress, bedcover, blanket, and pillows. Luggage racks are provided. The rooms can accommodate up to 2 people. Additional mattresses are available upon request. Guests can avail of milk shakes, tea, coffee, beer, soft drinks and snacks all throughout the day. Breakfast is served at an additional fee with a wide range of choices available. Air-conditioner, fan, 42” beds and pull-outs, bedside table, lampshade, bedcovers, blankets, pillows, luggage racks. Air-conditioned/fan rooms, art gallery, balcony, bar, BBQ area, common toilet and bath, dining area, garden, common kitchen, parking space, power supply, reception area/TV lounge, tour assistance, umbrella-shaded sitting areas. 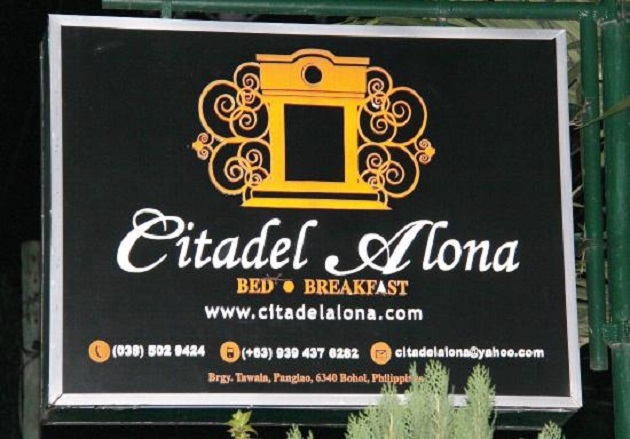 For those on a tight budget, Citadel Alona Inn, offers affordable room accommodations and other facilities. It is not situated on a beachfront, however, it is only about 8 minutes walk away from the well visited Alona Beach where one can avail of aqua sport equipments and enjoy the coral white sand and the cool blue waters of the Bohol sea. Walking from the Inn to Alona Beach, one will pass by a lot of small stores where sundries are cheaper. Restaurants, bars, and small eateries are available for meals and snacks.